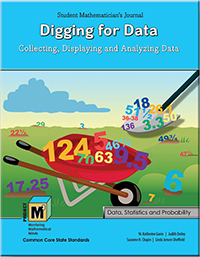 The focus of this unit will be on collecting, analyzing and interpreting data using a variety of data displays such as line plots, line graphs, tables and charts, double bar graphs, and pie graphs. Students begin with experimental research by conducting experiments to answer research questions. We have chosen activities that personally relate to students’ lives to add motivation and promote a real interest in the research results. Students will learn why the average is a more accurate descriptor than a single data point and how to make inferences from the sample they used to conduct the experiment (i.e., their classmates) to the general population of students at their grade level. Students also learn about descriptive research. Students learn how to design an effective survey to gather data. They experiment with the kinds of questions that should be on surveys and learn how the questions that are asked and the manner in which they are asked directly affect the data that they will gather. They learn how to analyze data, compare them between sample populations and present their findings to an appropriate audience. Instruction focuses on the creation and effectiveness of double bar graphs in comparing two populations. Students present their findings to a real audience, in this case the cafeteria personnel. This is very powerful in showing students how mathematics can influence decisions made by policy makers. Students also learn about historical research and use different data representations to explore trends and patterns in data collections representing events in the world around them. The activities focus on real data collected from a kindergarten population over a period of ten years. Students will use line plots, pictographs, pie graphs, and line graphs to record, represent and analyze the data. They will use the representations to make predictions based on the trends and patterns they find through the analysis of their data. Students will explore eye color, height and weight records from the kindergarten populations to represent on graphs, tables and charts.